We found a place in MG road that will blow away your minds with its exceptional rooftop seating and lighting. Sip and dine under the skies at The Rooftop Project and enjoy food and drinks at reasonable prices. Want to impress bae with the perfect romantic setting for a date night? Well, don't think much and opt for the quintessential dining option under the stars date at TRP to make your date feel special. The restaurant also spoils you for choice with a variety of cuisines. We loved the kebabs and cocktails- an ultimate combo to have. We have found you another rooftop date spot and believe us it serves amazing food and drinks. Dine under the sky at Classic Rock Coffee Co which has opened its fourth branch in Viman Nagar. We absolutely love the newly done-up interiors and open bar. Choose from their elaborate spread of starters like loaded nachos, mutton sukka, potato skins and chops. For mains, we suggest you opt for their Mediterranean and oriental dishes. To quench your thirst, you can try the amazing drink mixes, especially in the happy hour. Tiring day at the office? We found a place that will mesmerise you with its great drink selection and a spectacular view. 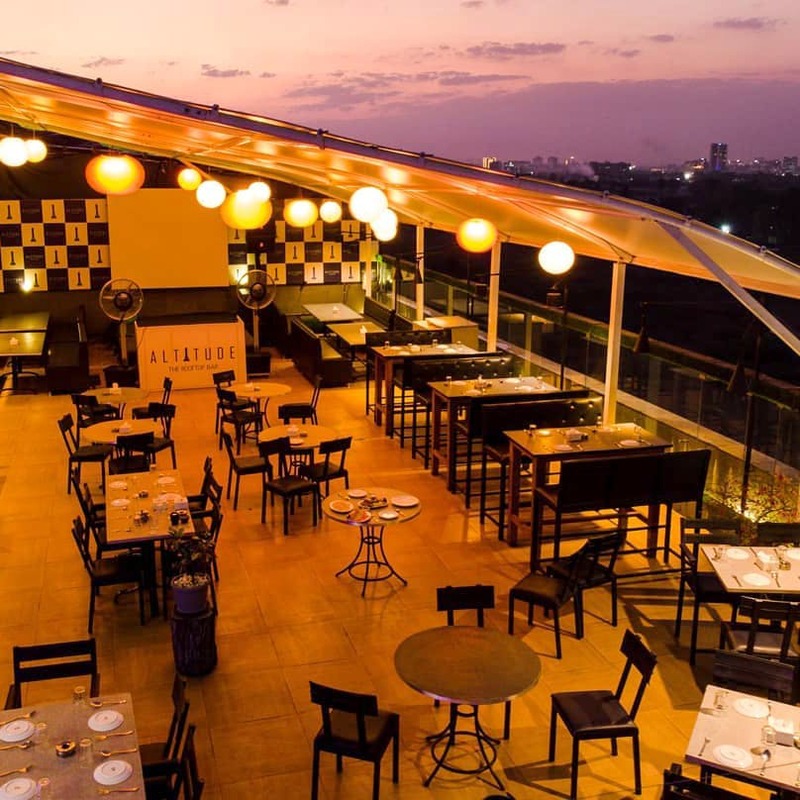 We have added Altitude-The Rooftop Bar in Magarpatta in our list of must-go places to unwind and chill. This rooftop place is beautifully done with and well-lit. We enjoyed reclining in the comfy cushions while admiring the city view and the hustle going down there. Now that winter has arrived, your fun will be doubled as you'll be able to gorge on their charcoal specialities with your favourite booze in this chilly weather. Try their stone-baked pizzas and small plates to pamper your taste-buds. After a successful stint in Baner, Kerala Cafe, known for its authentic Southern fare, has opened another outlet in the city. Nestled in the laps of the plush Kalyani Nagar, this boutique cafe is set to pamper us with Malabari cuisine. The outdoor seating on the rooftop is beautifully done up. We recommend you to book your table in advance to get a seat with the perfect view. Fish fry, stew, appam, kadala curry and sadya on a banana leaf and lastly, a spectacular view- what else could you wish for? Open sky, a green rooftop meadow, delicious food and heady cocktails! What an ultimate combo for a nice winter evening. Experience this at Kogobo, the newest resto-lounge on the block, known for its fabulous rooftop seating. You can choose between the cosy interior seating with wooden furniture and cabin-like interiors, or an outdoor rooftop seating under lanterns and stars. We suggest you opt for the outdoor seating which twinkles because of all the lights that they put up. Enjoy a heady mix of cocktails while ordering charcoal delicacies like reshmi chicken tikkas and mains like pastas in creamy sauces. Laa Unico is surely the best place for all vegetarians who want to experience food with molecular gastronomy but want to avoid non-vegetarian places. With both spacious indoor and outdoor (rooftop) seating areas, this place has a relaxed ambience and is perfect for family gatherings or dates. They also customise their seating section for birthdays, dates, and anniversaries for your loved ones. We loved the khaman oxide, pasta sizzler and Mexican nachos which is their in-house specialty.